Walk into any Steakhouse, Butcher shop or grocery store and it’s hard to not get overwhelmed by the choices. Various cuts sizes and labels confuse the average consumer and very few people know the difference between a Flat Iron and a New York strip. Each part of the animal has unique characteristics that, when prepared and paired correctly are a wonder to behold. Human history is very much intertwined with cattle and it was one of the first animals to be domesticated over 8,000 years ago providing not only meat but milk as well as leather for clothing and bones for tools and weapons. Modern cows are believed to be descended from Aurochs, large Ox like animals from the middle east though the last know one died in Poland in 1627. 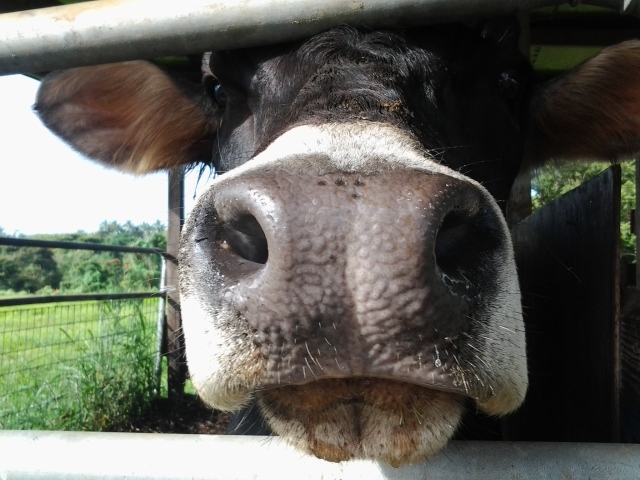 Currently there are over eight hundred recognized breeds that have been developed for various climates as well as dairy cows raised to produce milk. Most breeds weigh between 1,600-2,400 pounds with the current world record holder at an astounding 3,682 pounds and standing at over 6 feet tall. Cows are also very important to various cultures around the world, often as symbols of strength and fertility, especially in countries around the Mediterranean Sea and in India where they are worshiped as Gods by certain faiths. Beef is currently the third most consumed meat worldwide following pork and poultry. While the US buys the most, it’s the people of Uruguay with the highest consumption per capita with the average person eating 93 pounds per person compared the the 53 pounds per year the average American eats. Some key things to remember is that not all beef is raised and processed the same way and this in turn affects the quality of the final product. Now there are a lot of various labels and it’s hard to tell what means quality and what is a sales pitch. Here are a few things to look for whether you are out to dinner or at your local Butcher shop. Grass feed means that the cows were typically raised on a pasture on a natural diet and not feed grain though they may have been finished at a feedlot. Organic: This means that the cows were raised without growth hormones and are typically grass fed as well though they may be finished at feedlots using an organic diet as well. USDA PRIME: If you’re eating this you will know it since it’s typically not available in grocery stores and hard to find in Butcher shops, this grade of meat is normally purchased by high end restaurants and hotels. USDA CHOICE: Though this grade of Beef has slightly less marbling than Prime grade, it is still your best bet for a tender and flavorful cut of meat. This represents the high end of what you will find in most grocery stores and is worth paying the extra few cents per serving for. Wagyu : This is not a grade of meat but a distinct breed of cow from Japan that has been raised to have heavy marbling throughout the meat. Over the past few years this breed has grown in popularity with both Chef and home cooks becoming fans after just one bite. Several ranchers in the US are now raising both pure bred Wagyu cattle as well as Angus cross breeds commonly known as American Kobe. On that note, Kobe is a type of Wagyu beef and is the most well know. Kosher Certified: This means that the cow was raised, slaughtered and processed in accordance with with Jewish dietary rules and guidelines. Halal Certified: This means the the cow was raised, slaughtered and processed in accordance with the dietary laws of the Islamic faith. Certified Angus Beef : This is a label given by the beef industry to cows that are raised under a very strict set of guidelines to ensure that the consumer is getting a consistently high grade product. Currently there are over 35,000 ranchers in the US and Canada that participate in this program and it’s one of the best known by the general public. The Rib cut contains the Ribs and is also where we get ribeye steaks as well as Prime Rib. The Brisket. Used for Barbeque as well as making Corned Beef and Pastrami, this cut is located right below the Chuck. 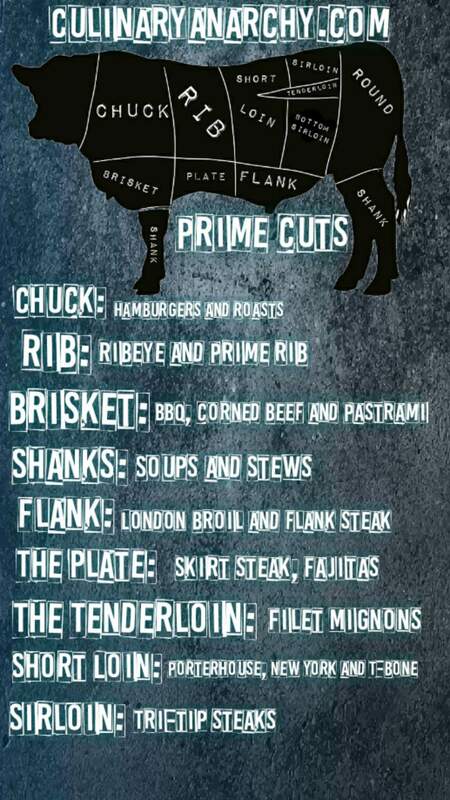 The Flank: This is where we get flank steak and London broils from. The Tenderloin, as its name suggests, is the most tender part of the cow on top of the lower back, this is where we get Filet Mignons. The Short Loin is located towards the lower back and is where the T-bone and Porterhouse and New York Strip are located. The Sirloin: It’s not as tender but it’s loaded with flavor and contains the underrated Tri-tip cut. From the various prime cuts we get the menu cuts and this is what you will find served in most restaurants and on display at the stores. Filet Mignon: This is often the most expensive steak on the menu since it also comes from a very small part of the cow. Since this part of the animal isn’t load bearing, the meat is revered for being the most tender cut of steak. The drawback to it being so tender is that it doesn’t have much, if any fat and thus very little flavor. This is why you often see them served wrapped in bacon and/or topped with butter or blue cheese. Prime Rib: Coming from the center of the animal, this is one of the most commonly served cuts of steak. Often, the entire section is roasted and the steak is served medium rare in it’s own juices or sliced thin for sandwiches but they are also great on the grill and have a lot of flavor so you don’t need to season them as much as some of the other cuts of meat. When the bone is left in, they are also called “Tomahawk” steaks and these are quite large. New York Strip: One of the most popular steaks, they are easy to cook and work well with a variety of methods and have enough fat to give the meat flavor, without leaving you feeling cheated. For someone unsure about what to get, this steak is a safe bet. Flank Steak : Often underrated if not ignored altogether, the Flank steak takes a bit more skill to prepare and is a tougher cut of meat do to the high levels of fat. This steak needs to be marinated for a few hours and does best with slower cooking methods. Ground Beef: This can come from nearly any part of the cow though most often it’s made from the Chuck located towards the front. Ground beef is also labeled by its fat ratio, often 85/15 or 80/20, meat to fat content. The more fat, the juicier the ground beef and the more flavor though some people may prefer less fat. The main thing that you need to be aware of with ground beef is that it has a much higher risk of causing foodborne illness since it has a much greater exposed surface area to contaminate as opposed to a steak. Because of this, it’s recommended that it be cooked thoroughly until the juices run clear. This is especially important with young children and the elderly whose immune system might not be as strong. Veal: This refers to a baby cow, typically under six months old. Though prized for its tenderness a flavor, it has fallen out of favor with both consumers and Chef alike as they have become better educated on how this is processed. The meat industry has responded by changing its practices and guidelines to be more humane to the calves. The Maillard reaction is what causes foods such as Meat and Bread to brown and develop the distinct robust flavor that makes most people’s mouth water. It’s a chemical reaction that is caused between the Amino acids and reducing sugars. This happens at temperatures ranging from 280-330 degrees Fahrenheit while higher temperatures result in caramelization. First described by French chemist Louis Maillard in 1912, it was US scientist John E. Hodge who’s 1953 paper on the subject established its mechanism and brought it to the attention of Chefs who had known about it for years but didn’t understand how it worked. One of the beautiful thing about Beef is that there are as many ways to cook it as there are cuts of steak and not all methods work. Some cuts have a lot of fat and need to be cooked slow and low to become tender whereas others, such as a Filet Mignon have very little fat and are best prepared by searing or grilling briefly on high heat. Grilling: This is the first thing that comes to most people think of Steak and burgers and regardless of if you use gas or charcoal, it’s means to cook with high dry heat, typically above 500F. Broiling means to cook with dry heat from above and is a preferred method of cooking at major Steakhouses, sometimes in excess of 1600 degrees Fahrenheit. Roasting means to cook the meat by surrounding it with hot dry air though the temperature is much lower than grilling while the cooking time is increased. This is great for tougher cuts of meat since it allows the connective tissue to dissolve. Braising is similar to roasting though it cooks the meat partly submerged in some kind of liquid, often stock. This helps prevent the meat from drying out during the cooking process. Curing: This is a broad term that is more of a method preservation than preparation but this is how we get such products as Corned beef and Pastrami which is Corned Beef that has been smoked after curing. 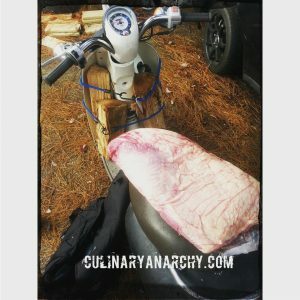 Much to the frustration of every Chef on earth, most people really don’t know the difference between Medium rare and Medium well and thus tend to order their steak overcooked and miss out on the natural flavor. Medium well is 150 or over and is best for hamburgers to reduce the risk of foodborne illness. Well done really means burnt and there is no reason to ever order a steak this way unless you want to anger your Chef or host by destroying it. For most people, a properly seasoned steak is pure bliss and the smell of beef cooking can stop most people dead in their tracks. The smoke and sizzle on the grill are the promise of great things to come. From burgers in the backyard with friends to a 28 oz Tomahawk at steakhouse in downtown, nothing satisfies quite like a great piece of beef.